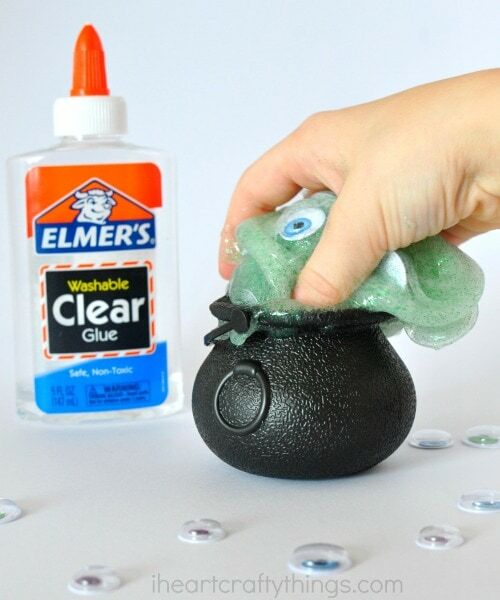 We have partnered together with Elmer’s today to share this awesome witches brew Halloween slime with you. I was compensated for this post and all opinions expressed are my own. 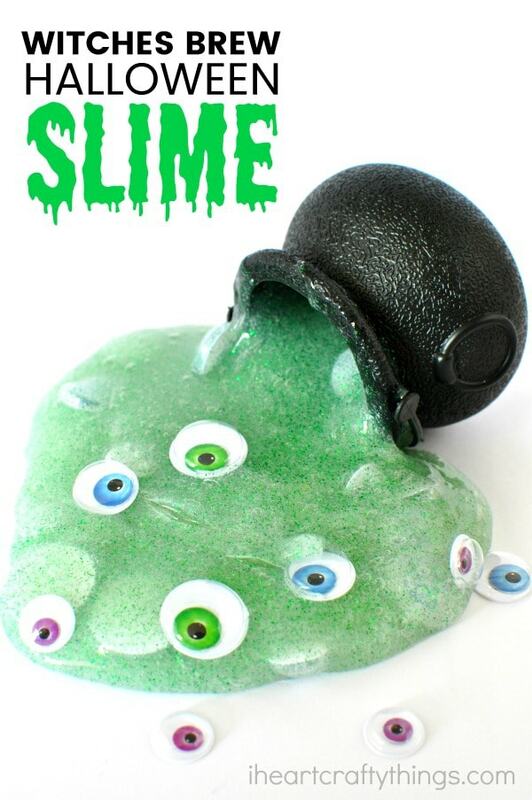 I can’t think of anything that screams “Halloween fun” more than ooey gooey slime. 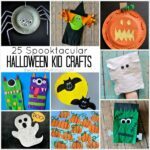 Whether you make it as a family fun activity to enjoy over the weekend or create it at a Halloween party, it is sure to bring big smiles and hours of fun for kids. 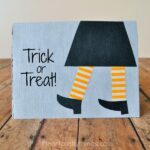 This witches brew Halloween slime we are sharing today is kid-friendly and simple to make with the help of an Elmer’s Slime Starter Kit. 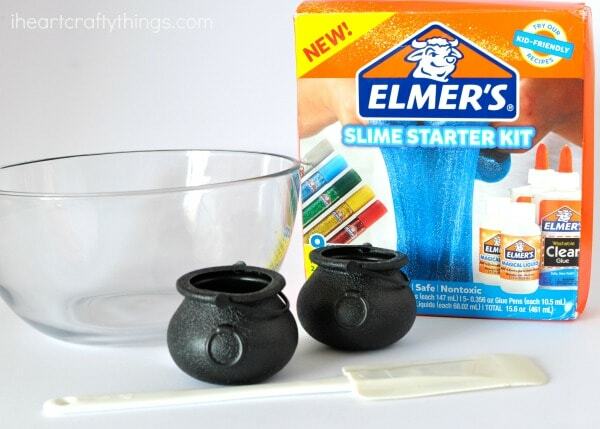 Did you know Elmer’s has a new line of Slime Starter Kits to make creating slime easier than ever? 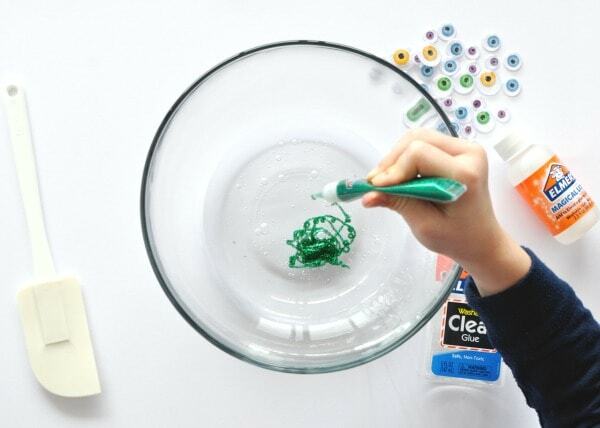 The kits include everything you need to make two batches of slime including clear glue, glitter glue and magical liquid. I love how everything is already measured for you making it perfect for kids to create slime all on their own (with adult supervision). In fact, using the kit and instructions on the back my daughter whipped up this witches brew Halloween slime in less than 5 minutes. 1. Gather your supplies. 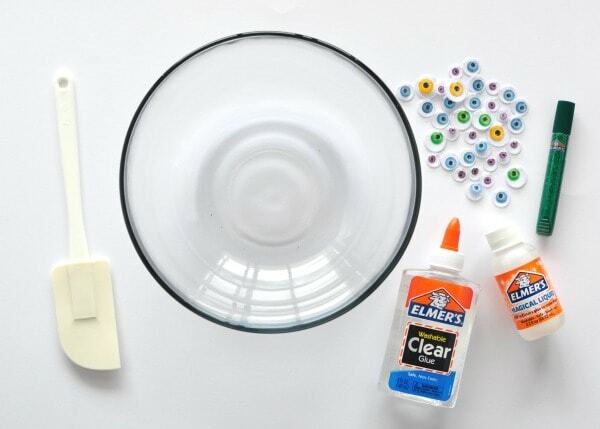 Open your Elmer’s Clear Glue bottle and pour it into your mixing bowl. 2. 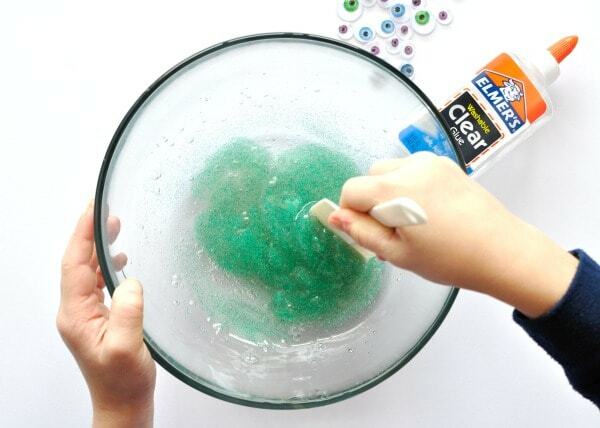 Squeeze a bottle of your glitter glue into your bowl. 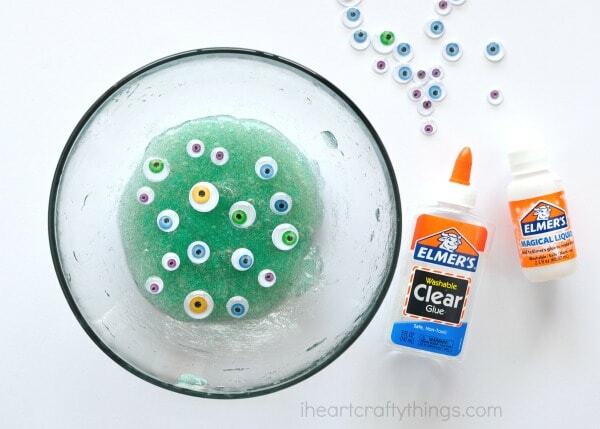 For a multi-colored slime, you can add a few different colors of glitter glue. 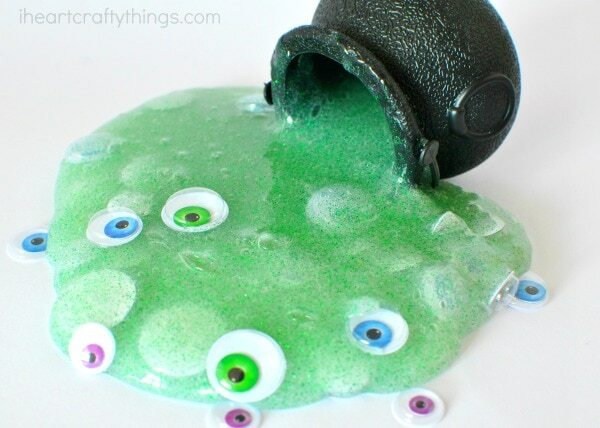 For our witches brew Halloween slime, we used only green. 3. 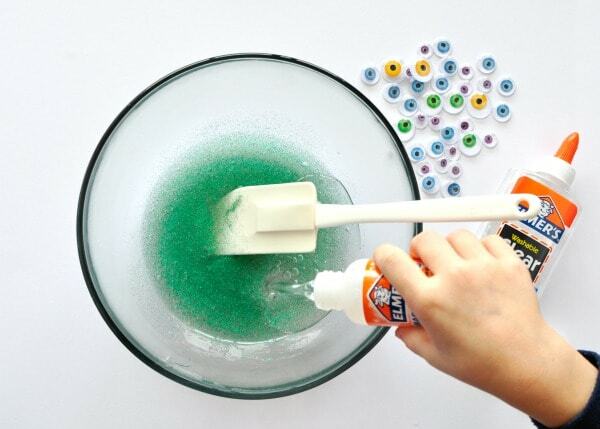 Use your mixing spatula to mix the clear glue and glitter glue together. 4. 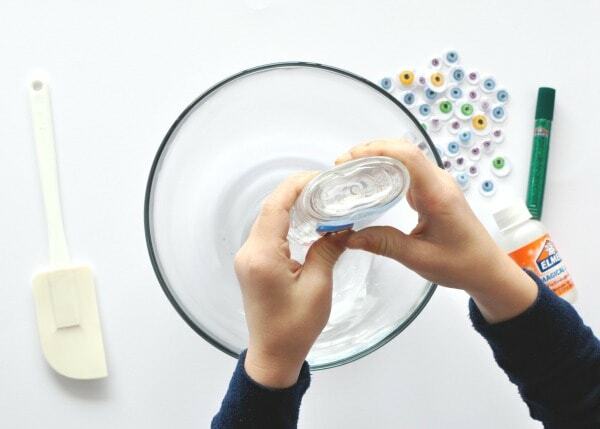 Open the Elmer’s Magical Liquid and pour it into your mixing bowl. 5. Use your mixing spatula to mix together the ingredients until slime forms. When the slime becomes difficult to stir we like to use our hands to knead it together for several minutes. One of our favorite tricks is to let it sit in the bowl for about 15 minutes after kneading it together. I think it helps the slime set together perfectly so it’s a great texture to play with. 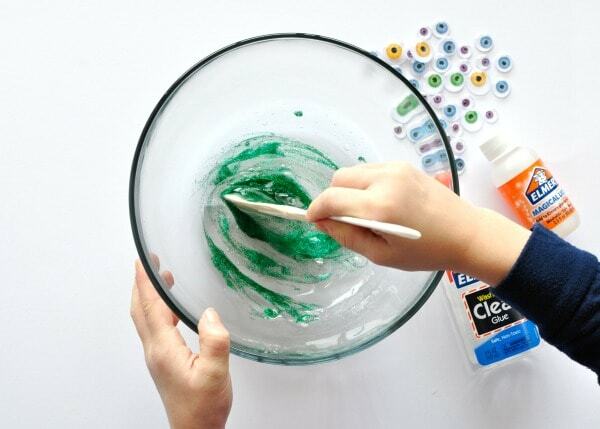 While your slime sets, add Halloween googly eyes on top to create an ooey gooey witches brew Halloween slime. 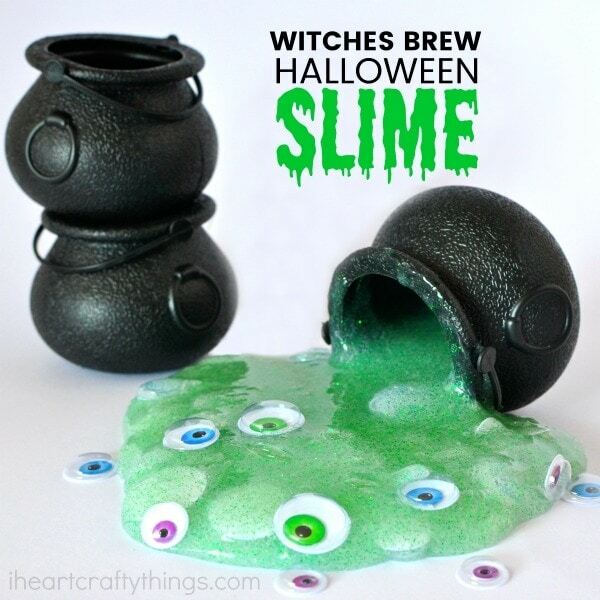 Your Witches Brew Halloween Slime is finished! 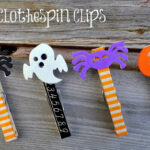 Grab your plastic witch cauldrons and have some ooey gooey fun playing with your Halloween slime.